Carla and I purchased half a lamb from a friend of her parents, and I kept thinking about curing part of it. 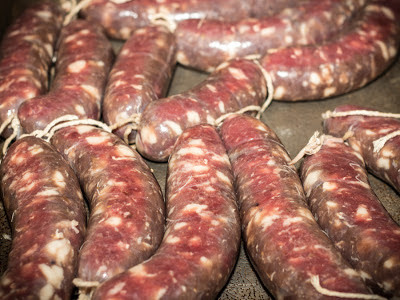 About two weeks ago, I took the plunge and made my first batch of lamb salami. This was also the first salami I've made with my larger grinder plates. In the photo I think you can see a much nicer definition to the salami, thanks to getting plates with a larger diameter. The lamb forcemeat was seasoned with red wine, fennel, and a bit of coriander. I used pork fat in this, as I'm not sure of the curing properties of lamb fat. I've read that pure lamb fat is equivalent or slightly higher in saturated fat as compared to beef tallow, so I stuck with the silky smooth seasoned veteran of curing; pork back fat. These were stuffed into pork casings that were inoculated with mold and left to cure in a warm room for a few days. As you can see from the photo, the sodium nitrate is just beginning to cure and turn the lamb meat a rosy pink color. Two things I've recently learned about nitrates (thanks to Oliver at North Woods Ranch), is that our bodies actually produce more nitrites than we consume. This article a had the especially provocative line: "salivary nitrite accounts for 70-90% of our total nitrite exposure." And the second thing new to me is that as the nitrates break down during curing to nitrites, our bodies break them down into nitric oxide, which is then removed by the body faster by exposure to adequate sunlight. You forget our skin is our largest organ, and it's amazing to me to think proper exposure to sunlight can help it clean and regulate our bodies. Looking at the fiery comments section of the first article on endogenously-produced nitrate, you can see this subject still gets people really fired up. But here, at the home level, I feel fine using nitrites in my curing, especially when I know the provenance of the animal, its care, handling, and diet. And aside from my own curing, this is the only processed meat that comes into our house. Well...and tinned sardines...but a man should be allowed a few vices.